With the subject of Palestine and Israel very much in the news since US President Trump’s announcement that America will recognise Jerusalem as the capital of Israel, there will be a chance for people in Hastings to hear a first-hand account of a recent visit to Palestine made by a St Leonards woman, Leah Levane. John Enefer writes. Levane travelled to the occupied territories in May last year as part of the largest ever Jewish delegation to Palestine. Jewish people are very active within the movements supporting the Palestinian people, with groups such as Jews for Justice for Palestinians and the newly formed Jewish Voice for Labour advocating on behalf of them. 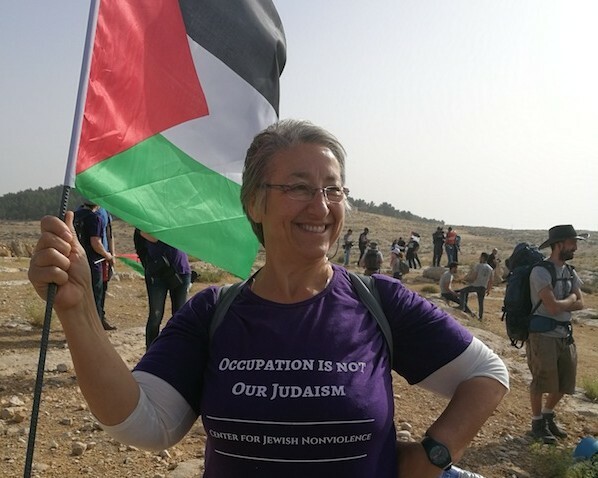 Leah Levane and her delegation took part in direct action to try to restore two families to their homes, twenty years after they were evicted by the Israeli state. Amnesty International has documented how, in the occupied territories, evictions and house demolitions of Palestinians by Israeli forces are common. Palestinians are routinely denied building permits and so are forced to build ‘unofficially’ and then face the prospect of being forcibly evicted later on. The talk has been organised by Hastings Against War. It is free and open for anyone to attend. The event will also feature a short performance by Las Pasionarias, a local singing group. Tuesday 6 February at the Quaker Meeting House, 5 South Terrace, starting at 7pm. I honestly can’t understand the attitude of many (not all) Israelis towards the Palestinians. The Nazis talked of themselves as “the Master Race”. Zionists and some other Jewish people talk of themselves as “the Chosen People”. Not much difference in thinking there, it seems to me. OK, the Palestinians aren’t being put in concentrations camps ready for slaughter, but they are certainly looked down upon by Jews and their opportunities are limited by poverty, discrimination, and, ultimately, force. Also, Zionists and their apologists say that the land they occupy was “given to them by God”. Proof? None. They “recovered” it by a combination of misplaced sympathy and, yes, terrorism – in the late 1940s, and later, after the 1967 war. And claiming East Jerusalem as part of the Jewish capital is just plain provocative when, in living memory, it was an integral part of Palestinian territory. I suppose all this MUST make me an anti-Semite. Btw, arabs are semites too.